Lavache ’18 competes with the Hamden Academy of Dance. People sometimes question whether or not dance is a sport, but the reality is that dance is both a sport and a performance art, making it a diffcult and impressive form of physical activity. It requires intense concentration, fexibility, and strength, culminating in exercise that strains both the body and mind. Dancers, unlike other athletes, have to make everything look easy, and learn to interact with their audience. Hopkins is home to many athletes, including several dancers in each grade. Kiarra Lavache ’18 is one such performer. performed a routine. But despite our two-minute glimpse into Lavache’s sphere of dance, her diligent training is a product of a lifetime’s worth of instruction. Lavache has danced for twelve consecutive years, making this year her thirteenth in the studio. She currently studies at the Hamden Academy of Dance and Music, as a member of their company. 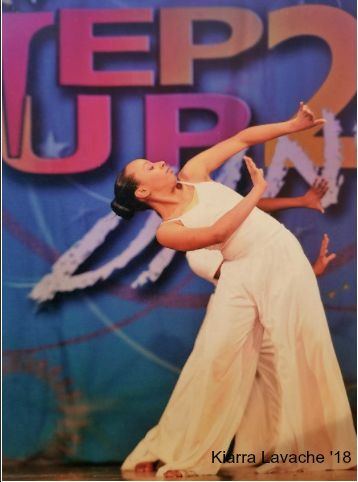 Lavache both performs and competes in group numbers with her studio. This past November, Lavache competed as a member of a hiphop group called Megahurtz at World of Dance, an elite competition with studios from across the country. Her studio has also travelled to Hershey Park in Pennsylvania, in addition to attending several local competitions. Most dancers are versatile, and like Lavache, are skilled in more than one style. Her favorite genres are pointe and hiphop, two seemingly polar opposite realms. “I like the challenge of pointe,” she says. “Not everyone is cut out for it.” Pointe is an advanced form of ballet, reserved for those who have already mastered dancing in regular leather slippers. The wooden shoes covered with satin are held together by nails and glue, rendering initial attempts painful and unsteady instead of graceful. Hiphop, on the other hand, does not confne to delicate movement, but is more interpretive, splitting into several subdivisions like breaking and popping. Ballet requires knowledge of an extensive list of terms, from battement fondu to pirouette en dedans, stemming from French words. Lavache, a French student, says the language connection is helpful for both mediums. “They both feed off of each other,” she says, aiding her in the classroom and the studio. Being a dancer and a Hopkins student isn’t easy, but Lavache has earned to manage her time well, juggling academics, sports, and friends as well as dance. The challenge has only made her more experienced and self-disciplined. You can see Kiarra in her next performance as Heather Chandler in Heathers The Musical: High School Edition.